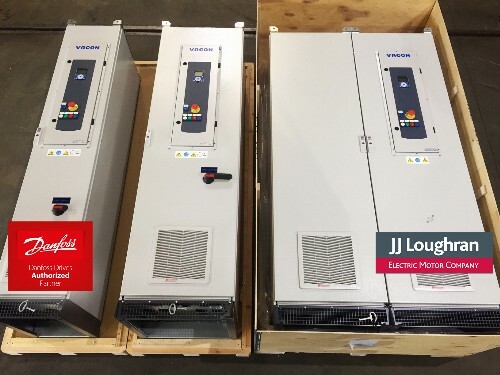 JJ Loughran are now stocking and hiring; factory built Danfoss/Vacon Drives up to 400KW in the VACON® 100 Industrial platform range, this platform is full of features and dedicated for a wide range of constant power/torque applications. These drives are perfect for key sectors including Water & Sewage utilities, Quarrying, Manufacturing, Chemical, Agriculture, Food Processing, By-product rendering and Power Generation. JJ Loughran are now stocking these larger sizes of drives locally as we understand our customers cannot afford long lead times on such key components. This investment by JJ Loughran will ensure our customers experience minimum downtime or lead-time within the industry. To complement this range JJ Loughran also stocking electric motors locally up to 400KW in size to ensure we can offer a full turnkey solution. Easy integration with plant automation due to extensive range of fieldbus options. Functional safety is improved with Safe Torque Off, which prevents the motor from generating torque on the motor shaft. Safe Stop 1 and ATEX-certified motor over-temperature protection.